Underneath the gray stone buildings of the Old Town lies a secret. Beneath the Old Town are the remains of yet an even older town filled with the ghosts of lives past. Don't believe me? 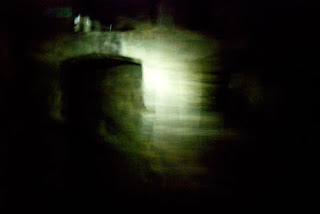 I dare you to explore the underground of Edinburgh. You'll believe. This Traveler began the day touring Mary King's Close, minus Traveler Two, who does not consider consorting with the undead a proper way to start off the day. 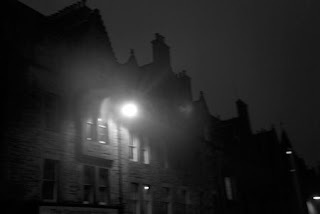 Mary King's Close is actually a series of closes and their associated tenement houses that originally stood more than seven stories high. 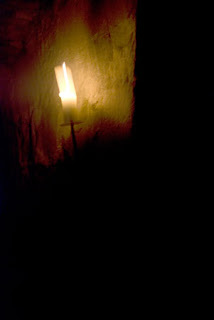 Many chilling tales are associated with Mary King's Close. Plague. Murder. Ghosts. All true. But, as many sources would have you believe, plague victims were never walled up within the close and left to die. Because of tax records, and other archived sources, much detail is known about the specific residents of the various rooms and apartments within the closes buried now under the City Chambers on High Street. How did the close get its name? Mary King married a local merchant, Thomas Nemo or Nimmo, in 1616. They had four children: Alexander, Euphame, Jonet and William. Thomas died in 1629. 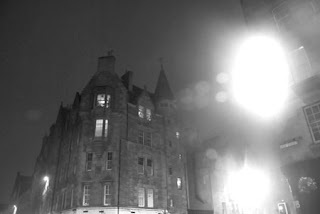 Mary and her children moved to what was then known as King's or Alexander King's Close. Alexander King was no relation to Mary. The name of the close was later changed to her name Mary King. According to my guide, a modern resurrection of Jonet Nemo, Mary's youngest daughter, Mary was probably a rather successful merchant herself. How did the close get underground? Most of the longer closes in Edinburgh run down hill to the north and south of High Street. Thus buildings closer to the High Street would have had fewer floors than those that were built near the bottoms of the closes. Some of these buildings reached twelve stories. By the mid-1700's many of the buildings of old Edinburgh, including parts of Mary King's and other closes, were in a ruinous state and overcrowding a real problem in the city. This lead to replanning of the existing city and the construction of the New Town to the north of Nor'Loch (now Princess Gardens), and the North and South Bridges. The Burgh Council decided to build a "covered place of exchange" across from St. Giles' Cathedral and the Mercat Cross, creating the Royal Exchange. Today it is the City Chambers. The top floors of the houses, of which one was Mary King's, were demolished and the lower sections were kept and used as foundations for the new building. This left homes, shops, streets, and the first indoor toilet in Edinburgh, mostly intact, yet hidden beneath the modern city. In the early evening I, Traveler One, made my way over to the Mercat Cross to meet up with the tour guide who would take me to the vaults beneath South Bridge. 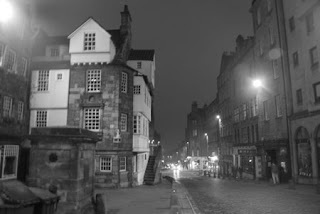 While I did not feel disturbed at all in Mary King's Close, South Bridge disturbed the hell out of me. It's one very creepy and dark place and This Traveler didn't even go on the ghost tour, she only did the Vault history tour. South Bridge was built in the late 18th century to help with traffic. North and South Bridge were created to help keep traffic out of the closes and create a way from the New Town to the southern sections of the city and the Medical College. The vaults were abandoned by the 1830s. They were not opened again until 1994. They remain unchanged and are as they were 200 years ago. The Vaults were originally created as a sort of 18th century mall if you will, filled with shops and taverns that catered to the upper classes. Leather goods, textiles, books, and ale were just some of the commodities to be had within the vaults. But, very quickly, the vaults were abandoned by the upper classes and merchants as the New Town gained prominence. Plus, the vaults leaked. Things then got a bit hairy down in the vaults. Whisky and hard liquor replaced ale in the taverns. Prostitutes moved in. Thieves gathered. Disease ran rampant. And then there were the body snatchers. Since the medical college was at the end of the bridge, was seriously lacking in enough cadavers for its students and, in addition, was paying for bodies, an new profession was born. A person could get 7.50 pounds for a body, the equivalent of six months wages at the time. Burke and Hare are the most well known of the body snatchers. 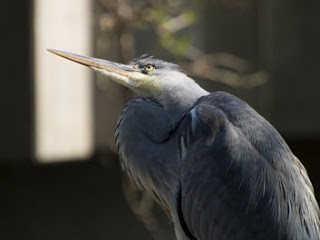 They, and their common law wives, delivered the body of a fellow lodger, who had died presumably of natural causes in this case, to the college. They would proceed to kill at least 17 people by getting them drunk and then smothering them. They would then deliver the bodies to the college for dissection. Burke and Hare were eventually caught. Hare took a deal and testified against Burke. The two common law wives and Hare escaped the gallows but Burke wasn't so lucky. After being executed, the luckless Burke would join his victims as cadaver at the medical college. It is purported that his bones are on display at the Edinburgh Medical College and there is a handbag made from his skin on display at the Police Center on High Street. When you first descend into the vaults you are taken into an area that used to be a tavern. You are very far beneath street level. It is very dark. The guide will warn you that some people are overwhelmed, feel dizzy, get claustrophobic, feel like they can't breath. Others will experience more, meaning that paranormal experiences are very frequent down there in the vaults.